CNET UK has tested a superzoom camera from Leica called Leica V-Lux 2. When I think about Leica a superzoom compact camera is not the first thing that comes to my mind, but Leica have a good relationship Panasonic and the V-Lux 2 is almost the same camera as the Panasonic Lumix DMC-FZ100. CNET UK ends up giving the Leica camera an overall rating of 3.5 stars out of 5. It does not get a top score because of the very high price tag compared to the Panasonic FZ100. There are several good points with the camera including useful zoom range, the video mode is good, stereo microphone and the fold out screen is nifty. On the negative side the reviewer finds aspects such as high price tag, the design is not Leica-looking and there is quite a bit of noise at higher ISO levels. 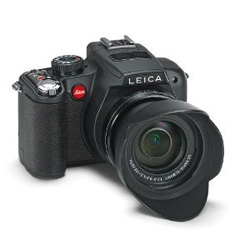 Read the full review of the Leica V-Lux 2 superzoom digital camera here.